In the absence of any specific constraints, very big gravitationally sculpted structures will tend to evolve into spheroids. An object’s gravity tries to pull all of its material, be it rocks, stars, or dark matter, as close to its center as possible. The outcome is a sphere. 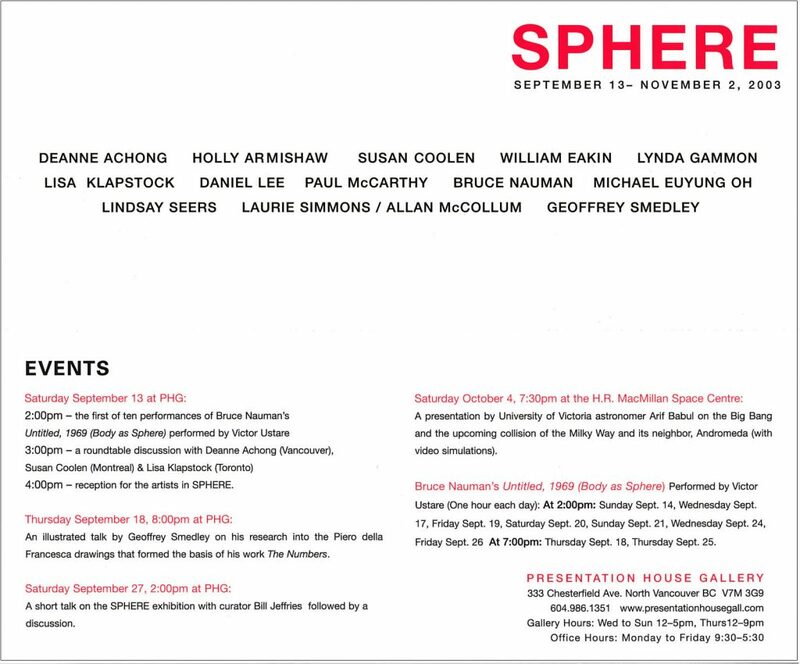 Presentation House Gallery opens the fall exhibition season with an international group exhibition of contemporary explorations of ‘the sphere’. The spheres selected for the show range from the microbiological to the cosmological, and include several explorations of the most photographed sphere of all, the human head. These crania are presented as both idealized forms and mutated spheroids. Over the past thirty years, as ‘global’-ization and ‘spheres of influence’ have had an increasingly large impact on the public sphere, many artists have been working around the new subject-area that the Dutch/German philosopher Peter Sloterdijk has recently coined as Spherology. Sloterdijk’s neologism is the subject of his three contentious books, titled Spheres. They have generated much debate in Europe, in part because he has extended and emphasized the notion that the fundamental importance of spheres reaches beyond science and into philosophy and art. The ubiquity and simplicity of the sphere-as-idea provided the organizing principle for the exhibition. Although Sphere is an exhibition that can be theorized in complex ways, the images in it are seductively easy to look at. Each artist in Sphere had specific reasons for working with the ideas and images in the show, but, taken as a group, they have mapped out some of the analytical possibilities in art for the fundamental strangeness, mystery (Lindsay Seers) and beauty of spheres. The spheres presented here are cultural artifacts (William Eakin) as well as metaphysical phenomena (Holly Armishaw). These works explore and analyze many spherical possibilities including the links between the lost ideals of Renaissance Humanism (Geoffrey Smedley) and contemporary ironic concerns (Laurie Simmons/Allan McCollum); between decay (Lynda Gammon) and entropy; between mutation (Daniel Lee, Paul McCarthy) and evolution’s crooked arrow. The human cranium as a constructed sphere is examined in the works by Deanne Achong, Paul McCarthy, Michael Euyung Oh, and Geoffrey Smedley. The sphere as an artifact of natural forces is at the basis of Susan Coolen’s practice, and Lisa Klapstock works with found holes that, as images, are spheres formed from negative space. Bruce Nauman’s late 1960s conceptual work Untitled (Body as a Sphere) receives its first-ever performances as part of this exhibition. 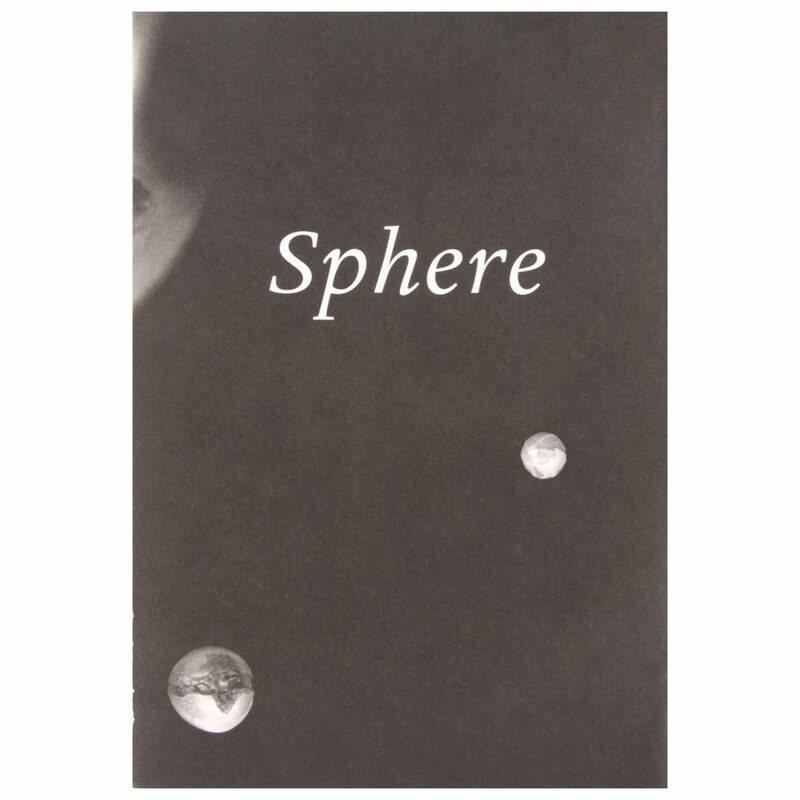 Sphere may be a speculative foray into the world of Spherology, but it is also meant to raise questions about how humans choose, and overlook, subjects in art and in science. Spheres, as a separate subject, have been outside the current paradigms in both areas, taken for granted, perhaps, as part of the background noise of the universe. It could be proposed, for instance, that the history of ideas itself, as a ‘working around the subject of knowledge’, can be seen as a spherical entity in which the accumulation of information enlarges the size of the bubble of knowledge. The idea that life is a thing of shape – such is the thesis we associate with the old and respectable expression of the sphere, borrowed from the ancient philosophers and geometers. This idea suggests that life, the constitution of spheres, and thought, are different expressions that designate the same thing. The exhibition features two projects drawn directly from recent scientific research. Dr. Arif Babul at the University of Victoria has created the first computer-generated simulation of the upcoming collision between the Milky Way and its neighbour galaxy, Andromeda. This will be shown as a video loop. A selection of colorful viruses imaged by Dr. Jean-Yves Sgro at the University of Wisconsin will be shown as framed works representing the microbiological end of the spherical spectrum. Presentation House Gallery produced a catalogue in conjunction with the exhibition. Ten performances of Bruce Nauman’s Body as a Sphere, the first ten days of the exhibition, performed by Victor Ustare. Essays by Arif Babul, Anna Carlevaris, Cheryl Cooper, Leanne Fulton, Bill Jeffries, Laiwan, Robin Laurence, Lucy R. Lippard, Melanie O'Brian, Helga Pakasaar, Lisa Panting, Ben Portis and Ian Wallace. Exhibition curated by Bill Jeffries. Catalogue designed by Timmings & Debay. Printed by Hemlock Printers.